A Chorus of Frogs is the final Venus Smith episode to air, and actually manages to be my favorite of her six entries into The Avengers canon. Steed has gone on holiday to Greece, but the mysterious death of a diver/spy interrupts his enjoyment of the sea and sand. So Steed hops onto millionaire Mason’s (Eric Pohlman) yacht, the site of the man’s death and the location of his three fellow “Frogs,” a team of smugglers/divers/spies. Venus Smith just so happens to be providing entertainment for the cruise around the Mediterranean – but she’s none too happy when Steed puts in his appearance in her cabin, insisting that he be allowed to sleep there. All is not well on the boat, of course – the death of another diver complicates matters, as does the presence of Anna Lee (Yvonne Shima), apparently a Chinese operative. Meanwhile, Venus appears to have finally gotten fed up with Steed’s insinuation into her life, and just about gives him up as a stowaway when the excitement gets the better of her. A Chorus of Frogs moves along at a good pace. The plot is somewhat sparse, but what it lacks in narrative sense it makes up for in characterization. Peppered with excellent character actors, including John Carson as the diver Ariston, the dialogue snaps better than any other Venus episode. 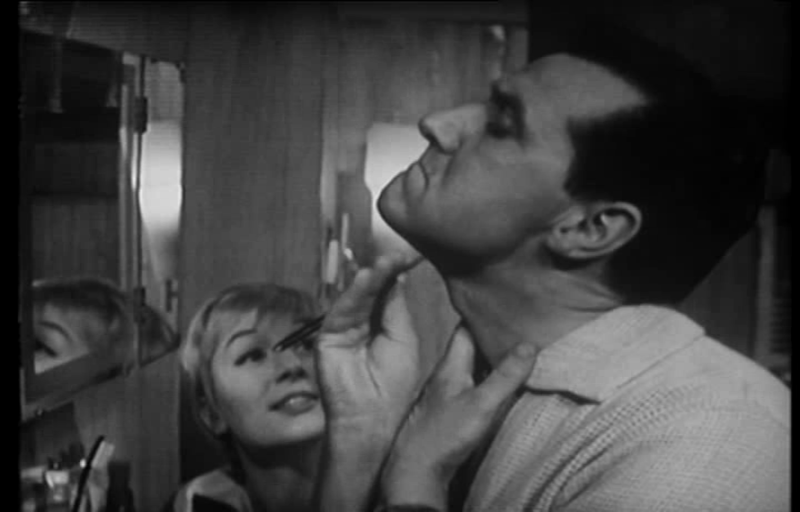 Some excellent rapport between Venus and Steed show just how tired she’s become of his constant invasions, as she gleefully watches him trying to shave with a dull straight-razor. 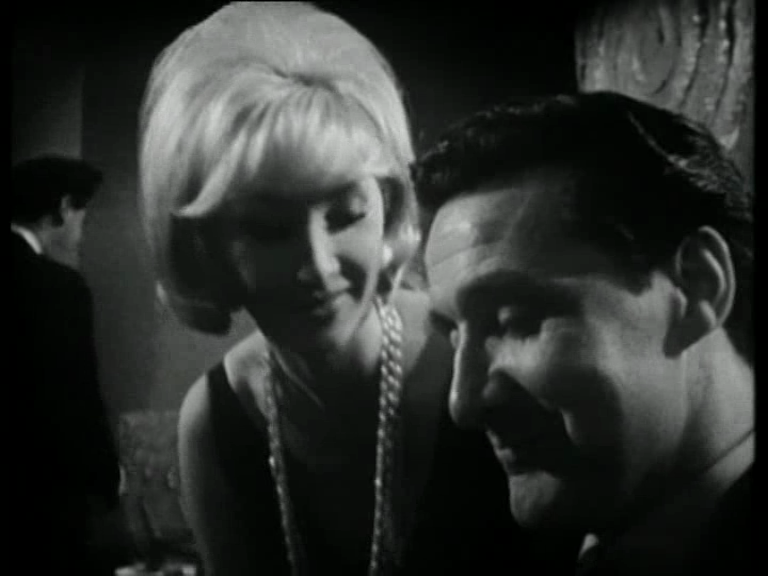 Steed is rather put-upon throughout the episode, threatened at gunpoint by the female diver Helena (Colette Wilde) in a scene that becomes a running gag. But it’s a dashing, water-soaked story, with some strong tension at the climax. Although Steed might at times put his partners into harm’s way (often without their knowledge), he never wants to hurt anyone and usually goes out of his way to make certain that innocent people aren’t harmed. A Chorus of Frogs shows off both his humor and his strong sense of justice – he has a desire to do right, and to protect as many people as he can, especially those he feels a personal responsibility towards. Venus Smith exits the series here; it’s a shame she wasn’t given a better chance to develop. While Stevens’s musical numbers might grate just a bit, Venus had some potential as a character if she could have shaken some of her naivete. However, like Dr. King before her, the writers evidently did not know what to do with her. So out she goes, making the way for Cathy Gale as the only partner willing to stick it out with Steed, which is probably just as well. Man in the Mirror (Episode 02-22, February 1963). With Cathy Gale saving the world from exploding stars, what is there for Venus Smith to do except wander an amusement park? Venus returns in her penultimate episode Man in the Mirror to assist Steed in proving that a cipher expert who recently committed suicide might not actually be dead. The impetus for the investigation comes when Venus wanders the amusement park where the man committed suicide and happens to snap a picture of him in a funhouse mirror – several days after he’s supposed to be dead. This is enough to launch her and Steed into the weird world of the amusement park, where they discover family drama, people held hostage, and a possible treacherous plot in the offing. Steed’s superiors make a few appearances during the second and third seasons of The Avengers (and thankfully disappear for the entire Mrs. Peel series). This time Steed finds himself somewhat at odd with his boss, who accuses him in the opening scenes of being a lone wolf, declining to play by the rules. It’s a neat little scene, and highlights what makes Steed so likable in the early seasons – while he might dress the part of a traditionalist, he’s quite far from it. Venus, meanwhile, has fully transitioned into a teenager. When Steed brings her back to the amusement park, she’s carrying a teddy bear and chewing on a candy-apple. The dynamic between them has ceased to carry any possible sexual implications – Steed not only towers over her physically, but she’s apparently regressed from a twenty-year-old to a seventeen year old. Her continued naiveté about Steed’s profession remains inexplicable – this is the fifth time he’s involved her in a case, and a fifth time that she’s gotten in too deep. The uncertainty of Venus’s character might very well be what got her eliminated from The Avengers altogether. There’s no ambiguity between Steed and Cathy on a professional level – she’s well aware of his job, and he never tries to fool her about it. Yet Venus goes between having a competent understanding of Steed’s work, and an apparent ignorance that seems laughable this late in the game. The youth/age dynamic (which will unfortunately reappear in the much later Tara King season) means that there’s little chance for parity between them – Venus is far too much of a child to be a proper partner. There are some enjoyable moments in Man in the Mirror, however. The villains capture Venus at the climax, revealing one or two salient details about their plot that on first viewing quite surprised me. Steed’s dedication to protecting her is quite sweet, even if he does always get her into trouble in the first place. While it’s a far cry from my favorite Venus Smith episode, Man in the Mirror can make for a diverting 50 minutes. The Decapod (Episode 02-03, October 1962). The Decapod introduces the world to Miss Venus Smith (Julie Stevens), who will change a great deal over the course of the six episodes she appears in (most notably getting a haircut and acting more and more like a teenager). Here she assists (to use the term loosely) Steed in hunting down a masked assassin out to get Yakob Borb (Paul Stassino), the leader of a Balkan Republic in Britain for trade negotiations. This leads both Steed and Venus into the odd world of amateur wrestling when one of Borb’s bodyguards is murdered in the ring by the mysterious Decapod. The Decapod represents this season’s first proper descent into the underworld. Venus works at a London nightclub that Steed frequents. He manipulates her into becoming Borb’s secretary (after his first one is murdered) by telling her that Borb wants to sponsor a singing tour. While Venus seems a bit too naive to be believed, she as yet has no reason not to trust Steed, who is at his fast-talking, charming best. Their relationship is a tad unclear, and will become less so as Julie Stevens’ tenure with The Avengers goes on. This episodes implies a sexual relationship, or at least flirtation, with Steed making very free with the innuendo (and the cards down Venus’s cleavage). The Decapod is actually a strong episode, despite featuring one of Steed’s most lackluster partners. The wrestling sequences entertain, as does Paul Stassino’s smarmy performance as Borb. Because of the constrictions of live television, most of the actors do their own stunts – including, it seems, Patrick Macnee, who gets thrown about in the wrestling ring quite a bit. Because Venus is so apparently weak and naive, however, it’s difficult to feel anything other than anger with Steed when he effectively prostitutes her to Borb (without telling her). There’s no doubt that, however much danger he puts his partners into, Steed always manages to get them out just in the nick of time. Still, the hardened, manipulative edges of Steed’s character is more on display here than in almost any other episode. Box of Tricks (Episode 02-17, January 1963). Well, you can’t win them all. While it is a mistake to expect too much from Venus Smith episodes, almost every other episode from her limited run at least has a reasonable plot. This one is so far-fetched, and so apparently dependent on strange coincidence, that I don’t really know what to do with it. Box of Tricks asks the question: what is the relationship between the death of a magician’s assistant and the apparent leakage of a number of state secrets? Perfectly legitimate question, if there was actually an answer to it. But halfway through the episode the story abandons a somewhat interesting murder mystery to focus on the machinations of a faith healer and his relationship to a high-ranking General’s daughter. The solution to that part of the case is obvious from the beginning, so why it takes Steed and Venus another thirty minutes to figure it all out is anyone’s guess. But as with even the most risible episodes of The Avengers, this one does have its good points. Steed gives a credible and entertaining performance as a hypochondriac millionaire, while Venus seems to be getting into her role as a secret agent’s girl Friday. 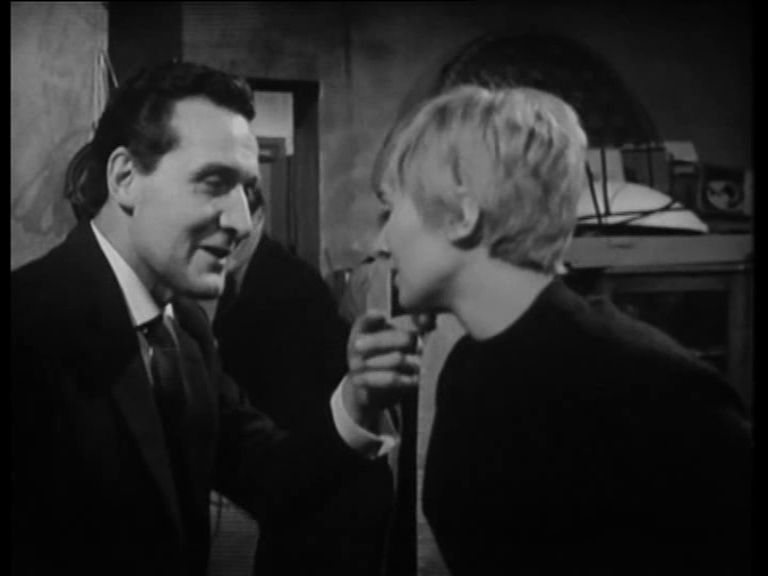 The repartee between the pair actually improves, though how Steed figures into Venus’s life is still unclear (he seems to have acted as her agent once or twice, but how he got into that business we shall never know). The noir tone of the nightclub scenes harkens to The Avengers crime drama roots, with Steed putting the moves on some of the girls (or them putting the moves on him). Steed’s hard edges are still there, his character rougher and his ability to traverse the social classes without rumpling his tie make some moments quite enjoyable. The noir quality is actually the most surprising element of these early episodes, especially as we’re used to thinking of The Avengers as a campy spy-fi show. It started as something quite different. As with most of the Venus Smith episodes, this one is strictly for the die-hard fans. The uninspired plot plods along to a strong if not surprising denouement. While far from a BAD piece of 1960s TV, it isn’t exactly brilliant. OK, not quite. Venus Smith first shows up in The Decapod, which I’ll probably cover at some point. But this is my blog and I do what I want! The Removal Men marks the second episode to feature Venus Smith (Julie Stevens), a nightclub singer and Steed’s other female partner. 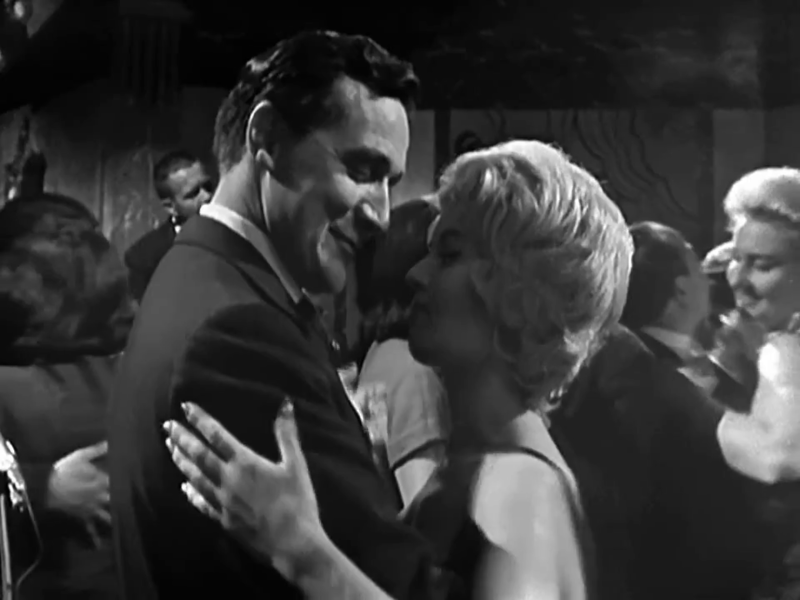 She appears a handful of times in the second series, before Honor Blackman’s Cathy Gale was a solidified second-in-command. Stevens is a likable enough actress, but the Venus episodes usually give her little to do beyond a few musical numbers and a few damsel-in-distress routines. It’s hard to believe that the same people capable of creating the tough-as-nails Cathy Gale could also create Venus Smith. The Removal Men follows Steed on vacation of sorts, as he attempts to infiltrate a Murder Inc.-style ring that assassinates high-profile people for money. This is a chance for Steed to do his ‘bad Steed’ impression, first breaking into Jack Dragna’s (Reed de Rouen) flat and locking his wife in the bathroom. Steed is finally hired to murder a French film star (Edina Ronay), but it all goes wrong when Venus happens to recognize him. As is usual with the second series, the plot plays second fiddle to the characters, but the plot here is stronger than many others. That being said, I’ve warmed far more to the Venus Smith episodes than I did on first viewing. Although Venus can be grating at times, she really is just an innocent who gets caught in the middle of Steed’s machinations. Unlike Tara King, who bears a strong resemblance to her in the final Avengers series, Venus really isn’t a spy and never wanted to be. She’s given more to do in her later episodes, but in this one she’s mostly window-dressing. Without a strong female counterpart to buoy him, Patrick Macnee bears much of the burden of moving the story along. For those who enjoy Steed at his roughest (and I do), that’s just fine. He’s a fast-talking antihero here; he’s remarkably cool at the climax. This is one of those eps that highlights the hard-boiled nature of the early series – shadowy nightclubs, smoky rooms and grinning villains aplenty. While not recommended for a first-time viewer, The Removal Men has some really excellent points.